One of my favorites! Mexico always has good things. Wow! Eleanor Rigby has a wild rhythmic break and a goofed up harmonic moment that are hard to hear as unintentional. There is a strange incorrect music here, but it is very much music. The Tepetlixpa "Hey Jude" is in Volume IV of the Exotic Beatles collection from Exotica Records (http://www.exoticarecords.co.uk/beatles.html). I am trying to get a peek at the liner notes without buying the CD, since one more CD packed into my house will produce critical mass and cause meltdown or explosion. In my case, It was the "Easy Melodias" comp of '60s latin grooviness where I first discovered these guys. One track was not enough, I had to track down the whole album. So, I found an article on the "15 Worst Covers of Beatles Songs" (http://www.openculture.com/2012/06/butchering_the_beatles_crowdsourcing_the_covers_so_bad_theyre_good.html) with "Hey Jude" from Tepetlixpa. A comment after the article tells a tale of The Beatles visiting Tepetlixpa and inspiring the local band. Even the teller of the tale is not convinced it's true. Why, even with OCD and DDG, can I not find a vinyl or CD version of the Tepetlixpa album on offer? I find ever so many mp3s, but no indication of any original published version. 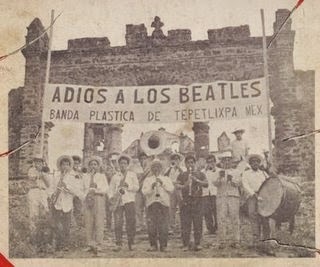 This review (http://sangrepesada2.wordpress.com/2007/09/11/banda-plastica-de-tepetlixpa-mex/) claims that the album was really recorded by a community band in Tepetlixpa. It doesn't mention the Beatles' visit, but pictures at the top might show Beatles in the little town. The article repeats the 2000 date (of a CD re-release?) but the comments claim a vinyl LP from 1981. I haven't found a single offer of a used copy yet. Google does a very comprehensible translation of the Spanish into English. It might even be mostly correct. Sounds like you haven't found much more info than I did (and yes, whats out there is mostly en espanol). I did find one source that dated the album 1973. But who knows. I'm calling hoax on this one! If this really was recorded about 45 years ago in a tiny Mexican village, how come the quality of the recording is that good? If that photo is supposed to be authentic, apparently the local photographer's camera was so ancient that he was still taking sepia-tinted pictures in the late sixties! What are the chances that any of the locals even had a reel-to-reel tape recorder? And is it likely that they could afford to have the record made at their own expense in a proper studio? Also, the album title and that picture with the banner put me very much in mind of the incident described in "The Electric Kool-Aid Acid Test", when Ken Kesey, in an (unsuccessful) attempt to get the Fab Four to visit him, erected a banner over his driveway reading "The Merry Pranksters Welocome The Beatles". I think what we're dealing with here is another bunch of merry pranksters. Mucho Gracias. I really don't care for Mexican pop music, but there once was a site called Mexicovers that had Latin musicians covering American and British pop songs. I downloaded everything they had and enjoy it tremendously. They didn't have this one, so thanks. Yellow Submarine has finally found its proper music setting. Yes, "Yellow Submarine" is naturally rather brass band-y, isn't it? Count Otto, I noticed that too: it's certainly not a "field recording." But then again, anything Beatles was considered potentially lucrative, no matter how ludicrous (e.g. : "Baroque Beatles," "Beatle Barkers," etc). And it's not like these guys spent much time in the studio - pretty sure it's all one take, no overdubs! One never knows, does one..? Gracias Timmy! Now whos got the cerveza? Thanks windy. $49, eh?! No info, but obviously a dif album cover, so it looks like it was reissued at least once (on the "Caleidofon" label.) Couldn't make out the liner notes on the back cover scan. This is riotous and glorious! This is actually the best thing I've heard in ages! It's on my iPod where it's played in my car to dirty looks from my wife, even more from the local Mexicans in our area. Areeebah!